The Skinny: An interesting narrative makes this a passable diversion, but the lack of actual drama makes it only remotely compelling. Despite decent performances and some rare intelligence, A-1 Headline is ultimately too cerebral to recommend, and too distant to get involved in. 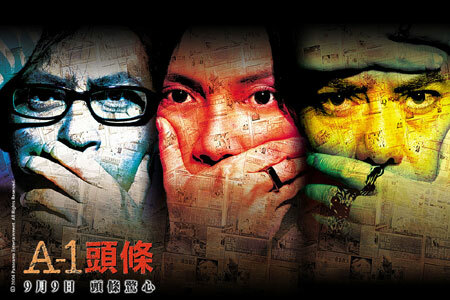 Hong Kong Cinema gets socially conscious with the drama A-1 Headline. Directors Chung Kai-Cheong and Gordon Chan collaborate on this dramatic thriller that asks if truth and justice can come at too high a price. To dissect this theme, we get an involved, intelligent screenplay and a variety of solid Hong Kong actors, including the venerable Anthony Wong, the dependable Tony Leung Ka-Fai, and the capable Eric Kot. Teenage girls get Edison Chen, who barely registers onscreen in a mopey, lovestruck, slacker sort of way. Those who like babeage get the promising Angelica Lee, who's attractive and has actually won an acting award. Unfortunately, the filmmakers forgot to include one major factor: drama. Without that, A-1 Headline can only muster a low B grade. Angelica Lee stars as Ling, a deep-in-debt fashion reporter who gets drawn into the story of a lifetime...maybe. When her colleague and ex-boyfriend Peter dies in an apparent drunk driving accident, she's broken up for about twenty-four hours, which is enough time for a mystery to emerge. Debt collectors Fei (Anthony Wong with shades) and Ma (Eric Kot with male-pattern baldness) get involved in Ling's life when they show up to collect her debts, but soon become more than passing players in her life. When visiting the site of Peter's death, Fei throws a bit of fuel on an almost extinguished fire: the cops have ruled Peter's death an accident, but Fei thinks foul play could be at work. As an ex-cop, Fei knows a thing or do about accidents, and the evidence at the accident scene suggests that either Peter committed suicide, or was murdered. Since Peter phoned Ling only hours before his death with the news of a supposed "A-1 Headline", murder seems the obvious choice. The trail leads Ling back to her editor-in-chief Tsang (Tony Leung Ka-Fai with weird hair and a moustache), who denies that Peter was involved in a big story. But there are more pieces to the puzzle. Tsang is acting more than a little strange, and Fei's minor investigations turn up some surprising leads. With the help of photographer Kevin (Edison Chen with geeky glasses), Ling decides to conduct her own investigation, and the answers could surprise and outrage not just her, but Hong Kong at large. In the stratified ranks of Hong Kong citizens, who calls the shots and pulls the strings? Is there a minor cover-up here, or something far worse? Does the possible corruption extend to public figures, the law, and even the fourth estate? And who will win the competition for Ling's affections: dorky Kevin, or too-cool and much-older Fei? And is that final plot thread worthy of any screen time whatsoever? The answer to that last question: no. Screenwriters Gordon Chan and Chung Kai-Cheong insert the dippy beginnings of a love triangle into A-1 Headline, and the result is an out-of-place and totally underdeveloped distraction to an otherwise intelligent and potentially meaty script. Never mind that Edison Chen's character is superflous, but the idea that so many guys are spurred on by their love (or lust) for Ling is silly at best, and totally unbelievable at worst. While Angelica Lee is an attractive actress with phenomenally expressive eyes, her character in A-1 Headline is more empty than interesting. A victim (or willing participant) of Hong Kong's spendthrift, debt-ridden culture, Ling gets drawn into this potentially scandalous mystery out of grief, and then ostensibly out of a willful desire to exact the truth from a purposely tangled web of mystery. The problem: her character isn't developed enough to convince, and Lee comes off as strangely inert. Given Lee's impressive work in Koma and 20 : 30 : 40, A-1 Headline is a curious misfire for the talented actress. However, Lee is more than compensated for by old pros Anthony Wong and Tony Leung Ka-Fai, who again demonstrate that they are among the best actors Hong Kong has to offer. Wong, in particular, brings a world-weary integrity to his role of the grizzled Fei, and the actor even manages to make limp drama like his supposed affection for Ling simmer onscreen. Tony Leung Ka-Fai gives a strong, opaque performance that probably provides a good 75% of the film's suspense, and even the usually annoying Eric Kot demonstrates that he has dramatic chops. Edison Chen is Edison Chen, which in A-1 Headline is not such a bad deal. The malgined actor doesn't annoy with any faux gangster speak (Note: it will be years before Chen is forgiven for Gen-Y Cops), but one has to wonder why they even created his character. Kevin's main function is to ferry Ling around on his moped, and pout because he's the lovesick platonic male friend. Edison Chen also gets to milk his puppy dog charms for a single scene where he all but admits his love for Ling. Teen girls may squeal, but that scene, and any romantic subplots of A-1 Headline, belong in a different movie entirely. Dopey romantic subplots aside, A-1 Headline offers a rare intelligent and socially conscious storyline that basically asks the age-old question, "Who watches the watchmen?" The journey that Ling and her assortment of male helpers takes leads them deeper into possible corruption and high-level graft, and the issues presented are somewhat troublesome. Unfortunately, any tough truths or shocking revelations are left to the audience's overactive imagination. Despite a multitude of possibly corrupt characters and crossing agendas, things get resolved in a shockingly static and convenient manner. The filmmakers take the easy way out and only make one or two individuals look bad. Everyone else gets off with a slap on the wrist, both legally and morally. It's almost as if the screenwriters couldn't dislike any of their characters, so they made them all pretty damn decent people. There may be ugly truths at the core of A-1 Headline, but the way they're presented makes them as easy to swallow as children's vitamins.